My sister and her family are back in Carlsbad, the holiday dishes are washed and put away, the colorful Thanksgiving centerpieces are tired and wilting. It was a nice visit. I am grateful to be able to write that one simple sentence. My family has been through a lot over the past five years. Like many families, we have watched a family member struggle with substance abuse issues and we have also watched helplessly as that struggle spilled over and touched all of us in different ways. The trail of hurt that is left behind by abusers cuts wide and deep with lessons that are sometimes difficult to accept, the main one perhaps being that love does not conquer all. But love can hold a family together if you let it. Through the pain, the disappointments, and the uncertainty of our crazy lives that tenuous thread of family love is worth tending and preserving, it’s a precious gift that merits our respect. 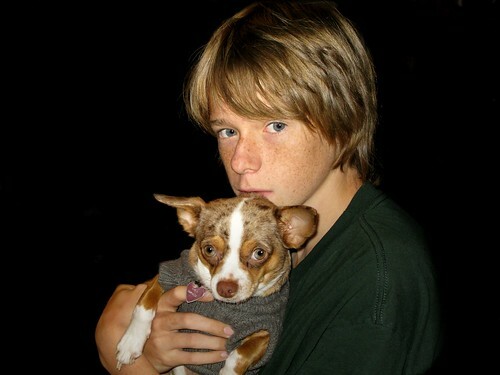 The photo above is of my wonderful young nephew Robert and his dog, Lola. Robert turned fourteen while he was here last week. He went to a Lion’s football game and a Red Wing hockey game and he spent Thanksgiving happily surrounded by his noisy, sometimes nutty family. If your extended family is struggling to stay connected, try harder to hang in there for the sake of the children. The next time you all get together let go of that Norman Rockwell family you think you should have, it exists only in your imagination. Let go of the past and all those bumps and bruises you’ve been so diligently cataloging. It was a nice visit…and that’s all it really needs to be. This entry was posted in family, my life, photos and tagged children, dogs, family, love, photos by Lilli Day aka bookbabie. Bookmark the permalink. Robert and Lola look like brother and sister! It is strange and cool at the same time!! GREAT photo. Carrie took it with my new camera and I photoshopped it a bit! That pic is so cool – can I get a copy? With havin so much content and artciles do you ever run into any issues of plagorism or copyright violation? My site has a lot of unique content I’ve either created myself or outsourced but it looks like a lot of it is popping it up all over the web without my agreement. Do you know any techniques to help reduce content from being stolen? I’d truly appreciate it. I mentioned this pic to Elsie – she wondered if she could get a copy too,????????????????? ?